Reality Twist together with Munich-based developer Mimimi Productions release game on iPad. 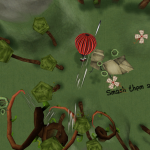 In “daWindci”, the player is controlling the weather and by this indirectly his own hot-air balloon. At the German Games Developers Awards 2010, the team ranked 2nd in the category “Gamesload Newcomer Award”. The title has already been intensively covered by print and television networks. The release is scheduled for Q1/2011. „This is a great compliment“, says Dominik Abé from Mimimi Productions to the news reporter from the RTL II television station. He’s obviously happy about his game winning the award at the German Games Developers Award 2010 in Essen, Germany. “For one year, you were working hard, have your vision, see it all come together and, at the end, even get awarded. This is fabulous!” Behind the team, there are five young students from the Munich University for Design and Computer Science. They have produced and programmed “daWindci” in their spare freetime.